Kenji Hiranabe from Change Vision visited Dr. Shuichiro Yamamoto at Nagoya University for an interview. 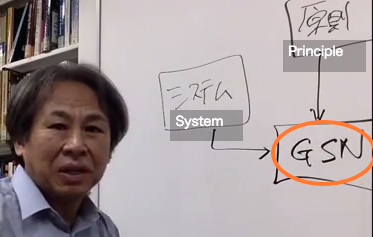 Dr. Shuichiro Yamamoto explained “what the GSN (Goal Structuring Notation) is, and what the GSN and D-Case are for”. Hello, I am Shuichiro Yamamoto. Today I am going to talk about the relationship between accountability and GSN (Goal Structuring Notation). Accountability is an ability to explain to others that a system activity or process conforms to a certain principle. This is the concept of accountability. So in order to achieve an accountability, there needs to be a way to explain the conformance that system is developed following certain principle or norm. And this is where GSN plays its role. so GSN is one approach to achieve an accountability to explain that a system conforms to a principle. In order to illustrate the arguments visually, GSN provides 4 types of nodes. First, Goal – in this example, a statement the “System conforms to the principle” is the top goal or claim. When it is difficult to explain the goal directly, you want to divide the goal into several sub goals to show the underlying thinking of the division – a strategy node is used. A context node is used to show a context or an assumption which following argument is developed. Finally solution node is to used to show that a lead goal is supported by an evidences. To sum up, GSN uses these four basic components to explain the argument structures of the claim. This is how GSN can help you achieve an accountability.